Iran… Known for its repressive government, Shiite-religious fundamentalism, millennia-old Persian civilization (more than 2,500 years of culture, including a huge heritage of historical remnants – praise and respect! ), beautiful women (these women have the most beautiful eyes in the world), tasteful ab kusht, even a successful wrestling team and a fabulous, undeniably attractive anti-appreciation for our Earth’s newest Caesar, Mister Donald T... But when it comes to Music, well, that might seem quite limited, even narrow-minded, in our western countries. However, those who dwells around in the Netherworlds know better. As a (Black) Metal fan, I can sum up a limited amount of fantastic Black Metal projects (often anonymous one-man armies) and some Doom and / or Death Metal projects too. For some of them I did write a review (or several reviews) in the past (From The Vastland, Margg, Zurvan, Nathorg, Azooma etc.) – in case you might be interested. However, there is a small yet vivid scene too within another aural genre that I do adore a lot, being the (Dark) Ambient / Drone / Noise / Experimental / Intelligent Dance Music one. You will surely find reviews I did publish on, for example, Alphaxone or Xerxes The Dark, but there is so much more to discover out there – sadly too often rooted in the anonymity of the Underground. More than a year ago, in early May 2017, Unexplained Sounds Group (a label run by Sonologyst frontman Raffaele Pezzella) released a compilation called Visions Of Darkness (In Iranian Contemporary Music). It is sort of a follow-up to 2016’s Persian Experimental Underground 016 Survey, a first acquaintance with Underground Music from Iran. Visions Of Darkness … was a digital release initially, eventually re-edited on a double compact disc format via Cold Spring Records almost five months after the initial release. And that is what this review will deal with. I confess that I did not know several acts on this sampler. Some I had never heard of before, and some I knew by name, but I didn’t know their Music. Others I was trusted with though. So, this made me quite anxious and, at the same time, aroused when listening for the first time to this compilation. But even after several listens, I am still confronted with a mixture of anxiety and arousal, wonder and confusion. Like I did for the Heresy compilation (http://www.concreteweb.be/reviews/various-artists-heresy) (I do mention this one because it was released via Eighth Tower Records, a highly interesting sub-division of Unexplained Sounds Group), I will not go too deep into each individual project’s history / discography, but then again each contributing artist is way too interesting not to spend at least a few words on. The duo (they are brothers, living in both Tehran and Brooklyn) Saint Abdullah opens this album, which lasts for almost two hours and a half (! ), with a short track (just over three minutes), called Unforgotten Promises. They seek (and find) their inspiration within the cultural, ethnic, religious and political roots of their home country, and the samples that are overpowering their contribution on this compilation, show that devotion of national influence. They perform an industrialised form of Experimental Music, a collage of electronic devices, thunderous beats and, as mentioned, lots of (spoken) samples. It’s somewhat tragic, I think, even though the beating rhythm expresses an extravert identity. And somehow there is a hidden presence of Neo-Folk laden attitude, presented by an urban and ritualistic outcome. Second track out of twenty-one is Longing To Return by Xerxes The Dark, probably one of the best known Iranian acts in our Western worlds. No further introduction on this project by Morego Dimmer. Those trusted with this project (hail Cryo Chamber, Amduscias Records and others, for their releases!) will surely know what to expect. Cinematic, long-formed Droning Ambient with an important injection of sounds and samples gets canalised into a haunting, even suffocating sonic ceremony – this time even somewhat sacral and esoteric towards the end, with those tribal elements. I had not heard of S.S.M.P. before. Apparently, this solo-outlet of Siavash Sojoudy was initially formed as a Post-Rock oriented project, but soon changed its style towards a chillier direction. The Blue Chasm is a floating, post-cosmic Ambient piece, electronic (not of the Hard-Techno, Low-Bit or EBM kind, yet rather IDM-inspired!) and psybiental, with accidental beats (towards the end; here comes that Chill-Out IDM-comparison), astral psychedelic sounds and transcendental synth lines. Within the Chill-Out trend, this might be one of the best tracks I’ve ever heard, and I will surely search for more material of this outfit. With Wherefore The Worm Universe, which is the first quite lengthy piece on this album (just over nine minutes of length), Limen (which I did know of before either) offers us a psychedelic journey through unexplored dimensions. Oriental melodies, neurotic frequencies, psychedelic ambience and spiritual electronics are collected into a very varying, permanently evolving aural noise, twisting the listener’s mind the whole of the time. Ali Phi is quite a productive visual and sonic artist from, of course, Tehran, who offers us a third chapter in his Condition Series, evidently called Condition.III. constantly progressing, this newest chapter is the perfected symbiosis of hypnotic minimalism and well-thought ritualism. Including hints of cinematic surrealism, Condition.III stands for the audible definition of both obscure and enlightening Ambient. Another notorious sound artist from Iran is Reza Solatipour, who released some fabulous things via Kalpamantra before. Those trusted with that grandiose label will know what to expect. And indeed, here too, this productive artist offers the listener his fabulous presentation of atmosphere and ambience. In an abyssal way,Surviving The Darkness stands for a magic, mystic and mysterious dreamscape, being oppressive and, at the same time, still levitating and sacred. It somehow shows a beauty behind a vast post-nuclear landscape of forgotten memories (damn, I’m dwelling into poetic madness…). Revolution is a piece by Nojan, it’s a floating, ethereal and transcendental piece, based on mesmerizing keyboard lines and injected by vocal samples, astral synth structures and soft-electronic details. Without leaving Earth, this is an astral travel through time and physical dimensions, only within the subconsciousness of man’s raison d’être. Here too I am totally overwhelmed by the spiritual atmosphere, which impresses and oppresses at the same time. Super! Hossein RangChi (from Dezful, not that far away from the Iraqi border) is inspired by traditional ethnic music at the one hand, and contemporary Pop / Rock Music at the other. His contribution however, called Mute (which clocks over thirteen minutes), has nothing to do with popular radio stuff whatsoever. Mute is based on semi-sad piano melodies with a cinematic atmosphere, penetrated with buzzing synth lines, noisy feedback and eerie sampling. Once again, this compilation presents a symbiosis of minimalism with elegance. despite the repetitive and simplistic piano tune, this track continuously progresses, with decelerating moments and frenzy eruptions. Narcissa Kasraï is not only a beautiful creature, yet also a talented artist, seen the track Articulation. The track is a collage of sounds, noises and effects, a mixture of Concrete Music and Experimental Noise, trying to tell a story (yet despite being instrumental, I am not trusted with the Farsi language, let’s say…). In its specific genre (which I normally do not like at all, I have to admit), I am satisfied by the atmosphere beyond. Track number eleven is Graph by Rhonchus, which I had not heard of before (except for the pneumological illness). Rhonchus are represented by a very cold (read: Arctic freezing) track, based on mesmerizing, dreamlike guitar lines, with a magnificent, esoteric atmosphere. Guitar-drones are sometimes boring-as-unhell, but this is, once again, a definition of the opposite. Mighty (once again)! Nowruz by DSM initially is like a tribal and ethnic ritual, but it slowly evolves into a rich amalgam of Dark Ambient, Oriental Music and Esoteric Drone. The addition of different sound and samples (singing birds, meditative percussion / bells, Tibetan / Oriental melodies) are such surplus! idft create, as they say, enchanting sounds to carry the audience into the revelatory act of observing the world. With the track DT they dwell into the uglier areas of the mind, I think. In a Lovecraftian horror-way, idtf combine a mostly darkened form of Ambient with those details that make the obscurest Industrial genres so obscure. Like a funeral ceremony, or a blood-ritual, this track crawls forth, invoking spirits that accompany the sacrificed soul to the Other Side. PooYar are represented with Burried Alive (mind the two r’s; it’s not a mistake of mine). They collect different field recordings (once again singing birds enter the stage) and samples, with manipulated synth melodies, quite droning in essence, melancholic piano chords, and industrialised structures, which result in an asphyxiating, uncomfortable but truly attractive piece of Aural Art. Esmail Azimi aka Anunnaki Signal brings the track Father, another astral piece of Cosmic Ambient. Father floats through endless and timeless spaces, entering post-dimensional areas of the (sub) consciousness. it’s like the exploration of untrodden paths, defined through psychedelic, dreamy waves of ambient sounds. Labrotary is a track by interdisciplinary artist Soheil Soheili, quite active within the Tehran Underground scene. Just like the former composition on this compilation, Labrotary explores unknown spaces via dreamlike, mesmerizing, even semi-meditative and hallucinating drone melodies. This kind of floating ambient waves attracts by its minimalism, for it builds up, step by step, revealing new elements and details again and again. The industrialised injections are nothing but a huge surplus. The shortest piece on Visions Of Darkness (In Iranian Contemporary Music) is …(For A Film) by Crows In The Rain, taken from their 2017 album Little Girl And Lost Blossom. Yet despite its short length, it impresses a lot. It’s depressing, tragic, theatrical and suppressive, delving deep into the wounds of pain, loss and despair, and mostly unhappy – which makes me happy (but that isn’t but my personal opinion). Downtown Of HongKong (what an inspirational name!) is another outfit I did not know at all. Here they are represented with Downtown Valley, a lengthy piece (almost fourteen minutes of duration) that brings that long-form kind of Ambient Music in the vein of several We Are All Ghosts projects. What can I say about that, except for expressing my respect for that UK-based label. It isn’t exactly a feel-good track, but it feels good to undergo and enjoy the somewhat tragic and down-tuned atmosphere of Downtown Valley. Despite the initial feeling of nihilistic minimalism, there is a permanently progression going on, based on so many levels of droning layers and spiritual / emotional atmospheres. The second half even offers something like a sacral orchestration, a semi-symphonic bombast with wonderful slowly-pounding melody structures and a deep-inspirational, even sacred attitude. 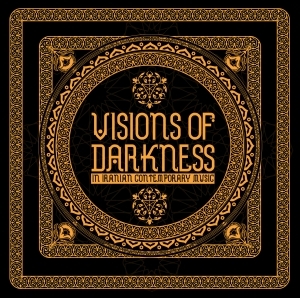 To end this double compilation album with, Visions Of Darkness (In Iranian Contemporary Music) offers the audience its longest composition, being Tehran Moonlight by Mehdi Behbudi and Vahide Sistaani. It’s a bizarre collage of found sounds, spoken (female) samples (in Farsi), electronic manipulations, sampled sounds (traffic and voices), and droning synths. It combines esoterism and integrity, surrealism and realism at once.